So here it is, 2016 and with it the challenges of new projects, goals and resolutions. I have three clear aims that I think are achievable, so I'm likely to stick with them: 1. To try to read 50 books this year. I generally seem to read close to that, 48 or so, so we'll see how I do. And I want them to be 'worthwhile' books so I'm starting with some that have won awards like the Pulitzer or Man Booker. So far Geraldine Brooks's The Golden Chord is proving to be a great way to begin the year. I highly recommend it. 2. Along with my eldest son, losing at least 4 kilos by April. That seems achievable at this point, but as the months progress, we'll see. Its good to think at least one other person is on the same track with me. This is my 'What Colour is Indigo?' quilt. Its now sandwiched and pinned and ready for quilting, but temperatures here are the direct reverse of those in the Northern Hemisphere, (around 30 degrees Celsius too many days for my liking) so moving the quilt through the machine unless I'm beneath an air-conditioning vent is just too warm. A friend of mine has just had a second granddaughter born, so I began a quilt for her. This is what I mean about beginning something new, and its only four days into the New Year! 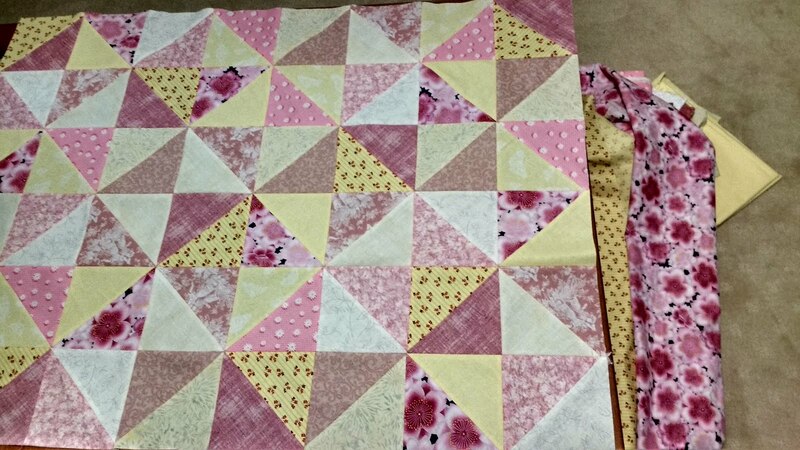 Again, too warm to be taking photos outside, so the colour is a little washed out, but the triangles are together and I'm thinking of the fabrics on the right as the borders, one skinny and the pink floral a little broader. I'd like to finish this before month's end, even though the new parents aren't really likely to need a quilt for a few months yet. Then I'll get back to the works in progress. I'd like to promise, but I think I'd have my fingers crossed at the same time. I am longing for warm weather again! Thanks Heidi, yes the Dressmaker is one for the list - and the movie too. Strange how we often want the opposite weather to what we're currently experiencing! I'd happily swap right now, 39 degrees predicted for today, air conditioning already on at 8:30am. 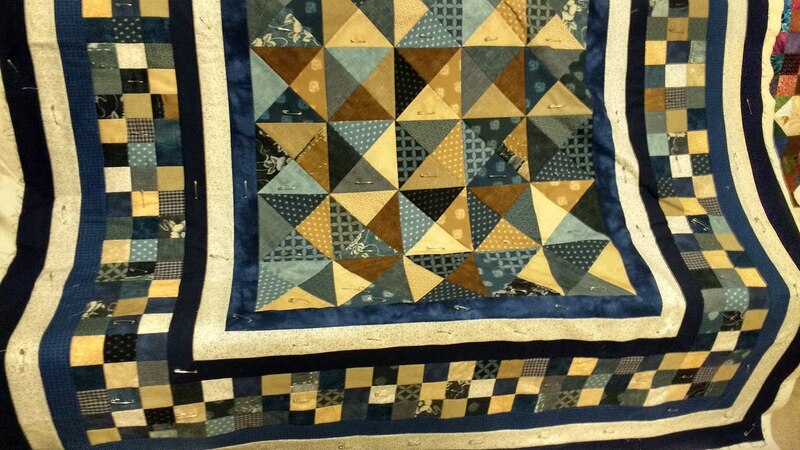 I absolutely LOVE your What Color is Indigo quilt! And quite agree with you about quilting when it's hot. I think that's why I don't have much to show in our hottest months. 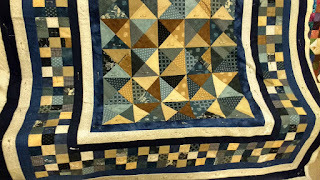 I am looking forward to quilting the Indigo, but know it may take a while before the weather is cool enough. Thanks for dropping by. That little baby quilt looks like pink lemonade to me. It is going to be gorgeous. I hope you get it done this month. Too, too, cute. 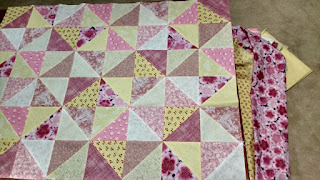 Thanks Bonnie, the top is now finished, that 'pink lemonade' is a great title. Now, how to quilt it? I love your What Color is Indigo? quilt! Wow! I read back about this. I wouldn't be excited about mitering all those borders, but you did a fabulous job of it!